September 17-21 is National Indoor Plant Week and your friends at MyFlorist are ready for this fun celebration that was established to promote and increase public awareness of the importance of live plants in interior spaces. If you are unsure of which plants you would like for your home or office, our experts here at MyFlorist will be happy to help you choose the plant that is perfect for you. Stop by and check out our selection of indoor plants and we’ll help you find exactly what you’re looking for. And if you can’t decide on the perfect plant, pick up a few different varieties and see which ones you like best! We have talked about this before, in fact we have talked about so many times that it seems that’s all we talk about. Flowers are awesome. Not because they are pretty and colorful, smell wonderful and make great gift but because they help us become happier. We have shown you finding from scholarly research’s conducted in Universities about how flowers alter a person’s mood for the better. We find that the same is true for nature in general. Yes flowers are part of nature. A beautiful part, but a part nonetheless. Think about it: when we go to on vacation or a retreat we normally go somewhere where the glory of nature is flagrantly displayed. To the beach where the majestic oceans, seas and lakes are, to the mountains where we marvel at their awesomeness, or to the woods or forests where it looks like even the tall trees know their impact of us. This is because we know that nature is powerful in its ability to relax us and center us. We don’t go to the hustle and bustle of a metropolitan city when we need some R&R. we go to where nature is present in full force. There are, of course times that we cannot go out into the wild or into nature and have it surround us so we can soak in all the good it does to our state of mind. This is why we need to bring nature to us. This doesn’t mean that you have to plant a forest in your yard or cover each square inch of your home or workplace with shrubbery. All you will need to do if have some element of nature close to us as a way to help us focus and relax. It could be a small dish garden on our desk at work or a green or blooming plant in the corner of our office or home, and you will find that where ever they are will pull on your focus and become your corner or zen and help you lower stress whenever life throws you a curve-ball. So go ahead and get yourself some beautiful flowers, lush plants and any other element of nature that brings you peace and surround yourself with it. Flowers, we love them, everyone loves them. Yes, even that girlfriend that said “Oh I really don’t like flowers” likes flowers and wants you to get them for her. However, the sad thing about flowers, is that they don’t live forever. You know what lives forever? Plants. Well maybe not forever, but for a very very very long time if we know how to take care of them. And do you know what some plants give us? FLOWERS!!! And when we have plants that live a long time and can produce flowers, we can have flowers all the time, or at least often. The question now is what plants should we get that will yield flowers and how do we take care of them? Our favorites are Phalaenopsis Orchid, African violet, and Peace Lily plants. Most people cringe at the thought of taking care of an orchid plant. They think they are difficult to maintain. We assure you, they are not. In fact they are so low maintenance you might even forget that you have them. Especially Phalaenopsis Orchids are the least needy of all orchids that you will be surprised how they manage to survive after so much neglect. They need medium indirect light and need to be watered once a week and be allowed to dry out completely before watering, which makes them perfect for those of us that tend to forget our plants or those that travel often. If you need to re-pot (when the roots start vacating their current home) make sure to add some new moist moss and bark chips to the new pot and you will not need to add fertilizers (score!). The plant should bloom 2-3 times a year; and once the flowers die cut the stem about 3-4 inches from the pot to allow a new healthy stem or stems to sprout out. Sometimes new stems will spring out of the “joints” of the old one, and when that happens do a happy dance for the bonus blooms. African violets are another that requires little to no attention. They do not need direct sunlight but need to be in a well-lit area so that they keep blooming. Water the plant properly when soil is dry but be sure to let it drain well. Fertilize every so often and when re-potting. African violets bloom quite often and quite prettily and they are the perfect size for small office spaces. 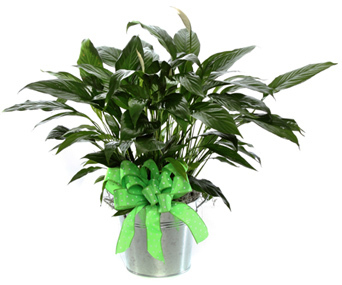 Peace Lily plants or Spathiphyllum as the professionals like to call them, are a broad-leafed green plant that spring out some white blooms that look like a cross between an anthurium and a lily. And we think anyone capable of killing a Peace Lily plant should just give up on owning a plant all together. They require indirect light and need to be placed in an area that is neither too hot nor too cold, therefore, a perfect indoor plant. Keep the soil moist and never let it dry out. By the way, just in case you were wondering, we have all those plants. In fact, all the plants we have are indoor plants. Many people have said that talking to your plants is good for them, but is it really? Is this just a myth or an old wives’ tale? Well, many people swear that talking to their plants or playing music for them helps them grow. In fact, according to one story, the man who grew the largest tomato in the world did so after putting headphones on it so it could hear soothing music! But does it really work? Some research says yes. According to a German professor who did a study way back in 1848, plants do actually respond to attention and talk. Of course, he also believed that plants had emotions. There hasn’t been any conclusive evidence on that, but studies have shown that, for whatever reason, some plants do seem to grow better when talked to. Of course, it’s possible other factors were involved. People who talk to their plants usually take very good care of them than people who don’t really care about their plants. Another study shows that plants and flowers do respond to music, but they have a preference: in one study, plants that were exposed to soothing and classical music grew better, but plants that had to listen to rock or loud, aggressive music, actually wilted and died. Again, this study wasn’t conclusive, and there could have been other factors involved. There might be a scientific reason behind talking to your plants—when we talk, we exhale carbon dioxide. Since plants use carbon dioxide to grow, this extra bit of CO2 might help. Now, researchers do caution that it would really take a few hours of talking to a plant in close proximity for it to really have a huge effect. So it seems like science is telling us that no, talking to plants and playing music doesn’t help. But then there’s that huge tomato to consider, and there are other examples of amazing plants and flowers grown by people who talk to them. Maybe there’s something to it after all? If you enjoy talking to your plants, there’s no reason to stop. Just be ready for some people to give you odd looks, especially if you claim your plants are talking back! Order a gorgeous green plant in McLean, VA, today!